Here's a snapshot of Uncle Sweeter Dabney in his debut performance. This was General Open Mic at the convention on Thursday evening. I am pleased with his performance and the reception he got from the audience of ventriloquists. This is what the Vent Haven Convention is all about, the opportunity to learn and test your skills in front of an audience of your peers. 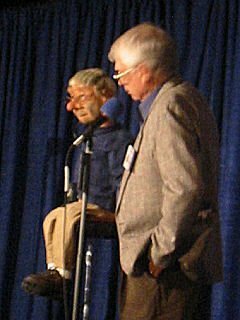 Anyone who is or wants to be a ventriloquist needs to come to Kentucky in 2007 and give it a try. Click the following link to learn when, where, and how.